We are sitting indian-style on the second floor of Leonard Cohen�s home in Los Angeles. On his bookshelf are many books that he�s written himself, including two novels and several volumes of poetry. An unearthly rain is exploding outside as he scans countless notebooks of song, endless revisions that span decades and which fill thousands of pages within hundreds of notebooks. For every verse that he keeps, there are untold dozens that he discards. When I mention that a lesser writer would have been happy with simply two of the six verses that he wrote for the stunning "Democracy" from his album, The Future, he answers, "I�ve got about sixty." His tower of song isn�t really that tall, only two floors that I can see anyway, but to him it�s both a fortress of solitude and a factory, a place where he says, "I summon every version of myself that I can to join this workforce, this team, this legion." It�s here that he gives songs the kind of respect bottles of fine wine receive, the knowledge that years -- decades even -- are needed for them to ripen to full maturity. Quoting from the Talmud he says, "There�s good wine in every generation," referring to the new songwriters who crop up every few years. But his own work has extended across generations and decades, packing as much brilliance into 1992�s The Future as he instilled into his first album in 1967. "I always knew I was in this for the long haul," he says, but somewhere along the line the work just got harder." Like Dylan, Simon, and few others, Leonard Cohen has expanded the vocabulary of the popular song into the domain of poetry. And like both Simon and Dylan, Cohen will work and rework his songs until he achieves a kind of impossible perfection. He didn�t need Dylan�s influence, however, to inspire his poetic approach to songwriting. He�d already written much poetry and two highly acclaimed novels by the time Dylan emerged, leading the poet Allen Ginsberg to comment, "Dylan blew everybody�s mind, except Leonard�s." In the beginning, Cohen was both a member of a Canadian country group called the Buckskins and a member of what is now known as the Montreal School of Poetry. When he wasn�t playing folk songs on his guitar, he was lyrically chanting his poetry. It was only a matter of time until the words and the music came together and Cohen became a songwriter. Songwriting was for him then, as it remains today, a labor of love. Few thoughts of making it a career entered his thoughts for many years. "We used to play music for fun. Much more than now. Now nobody picks up a guitar unless they�re paid for it. Now every kid who picks up a guitar is invited to dream." The first song he ever wrote was aptly called "Chant," a poem he loosely set to music: "Hold me heartlight, soft light hold me, moonlight in your mouth..." When John Hammond, the same guy who discovered Dylan, Springsteen, and Billie Holiday, heard some of Leonard�s early songs, he told him, "You�ve got it," and signed him to Columbia records. His first album, The Songs of Leonard Cohen, was an extraordinary debut for any songwriter and recording artist. Like later debuts by artists such as John Prine and Rickie Lee Jones, the level of writing on his first record achieved a resounding maturity and musical grace seldom found on a first album. In songs such as "Suzanne" and "Sisters of Mercy," Cohen moved beyond the realm of the popular song to reach into places previously untouched with words and music. His following albums continued to resound with beautiful, intimate poetry while stretching the boundaries of songwriting, in such classic songs as "Chelsea Hotel No. 2," "Joan of Arc," and "Famous Blue Raincoat." So moved was Kris Kristofferson by the simple valor of Cohen�s "Bird on the Wire" that he requested its opening to be inscribed on his tombstone: "Like a bird on a wire, like a drunk in a midnight choir, I have tried in my way to be free." Bob Dylan made the accurate comment that Cohen�s songs had become almost like prayers. It�s true: a certain sanctity connects all of Cohen�s work, a timeless devotional beauty that runs entirely opposite to almost everything that is modern. He was born on September 21, 1934 in Montreal. His father died when he was nine. At seventeen he went to McGill University where he formed the Buckskin Boys and wrote his first book of poetry, Let Us Compare Mythologies. His second volume, published in 1961 and entitled The Spice Box of Earth, was acclaimed around the world. But as it�s always been with his careers, the extreme acclaim that his work received never equalled extreme amounts of money. "I couldn�t make a living," he said." For seven years he lived on the island of Hydra in Greece with Marianne Kenson and her son Axel. While there he wrote another book of poems, Flowers for Hitler, and two novels, The Favorite Game and Beautiful Losers. Again the praise was vast and forthcoming but the financial rewards were scarce. The Boston Globe wrote "James Joyce is not dead. He is living in Montreal under the name of Cohen." But he was frustrated by the inequality between the praise and the money, and rejected the novelist�s life to move to American and become a songwriter. Contradicting the old adage that the devil is in the details, Cohen has shown many times that the divine can be discovered there. As he once said to Jennifer Warnes, "Your most particular answer will be your most universal one." It is the unique specificity of his songs that enable one not only to envision them but to enter them. The miraculous "Suzanne" for example, is a song towards which many songwriters have aspired, and it is Cohen�s descriptive use of details, along with one of his most haunting melodies, that distinguishes this astonishing song. When I mentioned to him that to this day it seems miraculous to me that someone could have written it, he agreed, not egotistically but with a kind of hushed reverence. "It is miraculous," he said softly. "There are always meaningful songs for somebody. People are doing their courting, people are finding their wives, people are making babies, people are washing their dishes, people are getting through the day, with songs that we may find insignificant. But their significance is affirmed by others. There�s always someone affirming the significance of a song by taking a woman into his arms or by getting through the night. That�s what dignifies the song. Songs don�t dignify human activity. Human activity dignifies the song. Are you always working on songs or do you write only for specific projects? No, I�m writing all the time. And as the songs begin to coalesce, I�m not doing anything else but writing. I wish I were one of those people who wrote songs quickly. But I�m not. So it takes me a great deal of time to find out what the song is. So I am working most of the time. When you say, "what the song is," do you mean that in terms of meaning, where the meaning is leading you? Yes. I find that easy versions of the song arrive first. Although they might be able to stand as songs, they can�t stand as songs that I can sing. So to find a song that I can sing, to engage my interest, to penetrate my boredom with myself and my disinterest in my own opinions, to penetrate those barriers, the song has to speak to me with a certain urgency. To be able to find that song that I can be interested in takes many versions and it takes a lot of uncovering. Do you mean that you�re trying to reach something that is outside of your immediate realm of thought? My immediate realm of thought is bureaucratic and like a traffic jam. My ordinary state of mind is very much like the waiting room at the DMV. Or, as I put it in a quatrain, "The voices in my head, they don�t care what I do, they just want to argue the matter through and through." So to penetrate this chattering and this meaningless debate that is occupying most of my attention, I have to come up with something that really speaks to my deepest interest. Otherwise I just nod off in one way or another. So to find that song, that urgent song, takes a lot of versions and a lot of work and a lot of sweat. But why shouldn�t my work be hard? Almost everybody�s work is hard. One is distracted by this notion that there is such a thing as inspiration, that it comes fast and easy. And some people are graced by that style. I�m not. So I have to work as hard as any stiff, to come up with the payload. So you�re not a writer for whom ideas simply appear? I haven�t had an idea in a long long time. And I�m not sure I ever had one. Now my friend Irving Layton, the great Canadian writer, said, "Leonard�s mind is unpolluted by a single idea." And he meant it as a kind of compliment. He�s a close friend and he knows me, and it�s true. I don�t have ideas. I don�t really speculate on things. I get opinions but I�m not really attached to them. Most of them are tiresome. I have to trot them out in conversations from time to time just to cooperate in the social adventure. But I have a kind of amnesia and my ideas just kind of float above this profound disinterest in myself and other people. So to find something that really touches and addresses my attention, I have to do a lot of hard, manual work. What does that work consist of? Just versions. I will drag you upstairs after the vacuuming stops and I will show you version after version after version of some of the tunes on this new album. You do have whole notebooks of songs? Whole notebooks. I�m very happy to be able to speak this way to fellow craftsmen. Some people may find it encouraging to see how slow and dismal and painstaking is the process. They switch off the Budweiser sign. It�s dark all down the line. For speeding, it�s a crime. Yeah, but now it�s closing time. And I recorded the song and I sang it. And I choked over it. Even though another singer could have done it perfectly well. It�s a perfectly reasonable song. And a good one, I might say. A respectable song. But I choked over it. There wasn�t anything that really addressed my attention. The finishing of it was agreeable because it�s always an agreeable feeling. But when I tried to sing it I realized it came from my boredom and not from my attention. It came from my desire to finish the song and not from the urgency to locate a construction that would engross me. So I went to work again. Then I filled another notebook from beginning to end with the lyric, or the attempts at the lyric, which eventually made it onto the album. So most of [my songs] have a dismal history, like the one I�ve just accounted. Generally do you finish the melody and then work on the lyrics for a long time? They�re born together, they struggle together, and they influence one another. When the lyric begins to be revised, of course, the line can�t carry it with its new nuance or its new meaning. And generally the musical line has to change, which involves changing the next musical line, which involves changing the next lyrical line, so the process is mutual and painstaking and slow. Do you work on guitar? It usually was guitar but now I have been working with keyboards. Does the instrument affect the song you are writing? They have certainly affected my songs. I only have one chop. All guitar players have chops. Especially professional ones. But I have only one chop. It�s a chop that very few guitarists can emulate, hence I have a certain kind of backhanded respect from guitar players because they know that I have a chop that they can�t master. And that chop was the basis of a lot of my good songs. But on the keyboard, because you can set up patterns and rhythms, I can mock up songs in a way that I couldn�t do with my guitar. There were these rhythms that I heard but I couldn�t really duplicate with my own instrument. So it�s changed the writing quite a bit. Writing in that way could be either more freeing or more restrictive. You have a rhythm that is set but you are free from playing the guitar. Well, freedom and restriction are just luxurious terms to one who is locked in a dungeon in the tower of song. These are just... ideas. I don�t have the sense of restriction or freedom. I just have the sense of work. I have the sense of hard labor. Is this hard labor ever enjoyable for you? It has a certain nourishment. The mental physique is muscular. That gives you a certain stride as you walk along the dismal landscape of your inner thoughts. You have a certain kind of tone to your activity. But most of the time it doesn�t help. It�s just hard work. But I think unemployment is the great affliction of man. Even people with jobs are unemployed. In fact, most people with jobs are unemployed. I can say, happily and gratefully, that I am fully employed. Maybe all hard work means is fully employed. We have a sense here that it�s smart not to work. The hustle, the con, these have been elevated to a very high position in our morality. And probably if I could mount a con or a hustle in terms of my own work I would probably embrace the same philosophy. But I am a working stiff. It takes me months and months of full employment to break the code of the song. To find out if there can be a song there.� When you�re working to break that code, is it a process of actively thinking about what the song should say? Because once the song enters the mill, it�s worked on by everything that I can summon. And I need everything. I try everything. I try to ignore it, try to repress it, try to get high, try to get intoxicated, try to get sober, all the versions of myself that I can summon are summoned to participate in this project, this work force. I try everything. I�ll do anything. By any means possible. Nothing works. Nothing works. After a while, if you stick with a song long enough it will yield. But long enough is way beyond any reasonable estimation of what you think long enough may be. In fact, long enough is way beyond. It�s abandoning, it�s abandoning that idea of what you think long enough may be. Because if you think it�s a week, that�s not long enough. If you think it�s a month, it�s not long enough. If you think it�s a year, it�s not long enough. If you think it�s a decade, it�s not long enough. Some songs take a decade to write. "Anthem" took a decade to write. And I�ve recorded it three times. More. I had a version prepared for my last album with strings and voices and overdubs. The whole thing completely finished. I listened to it, there was something wrong with the lyric, there was something wrong with the tune, there was something wrong with the tempo. there was a lie somewhere in there, there was a disclosure that I was refusing to make. There was a solemnity that I hadn�t achieved. There was something wrong with the damn thing. All I knew is that I couldn�t sing it. You could hear it in the vocal, that the guy was putting you on. �k Is "Anthem" in any way an answer to Dylan�s song "Everything is Broken"? I had a line in "Democracy" that referred specifically to that Dylan song "Everything is Broken," which was "The singer says it�s broken and the painter says it�s gray..." But, no, Anthem" was written a long time before that Dylan song. I�d say �82 but it was actually earlier than that that that song began to form. �k Including the part about the crack in everything? That�s old, that�s very old. That has been the background of much of my work. I had those lines in the works for along time. I�ve been recycling them in many songs. I must not be able to nail it. �k You said earlier that you had no ideas, but that certainly is an idea. Yeah. When I say that I don�t have any ideas, it doesn�t come to me in the form of an idea. It comes in the form of an image. I didn�t start with a philosophical position that human activity is not perfectable. And that all human activity is flawed. And it is by intimacy with the flaw that we discern our real humanity and our real connection with divine inspiration. I didn�t come up with it that way. I saw something broken. It�s a different form of cognition. �k Do images usually come to you in that way? Well, things come so damn slow. Things come and they come and it�s a tollgate, and they�re particularly asking for something that you can�t manage. They say, "We got the goods here. What do you got to pay?" Well, I�ve got my intelligence, I�ve got a mind. "No, we don�t want that." I've got my whole training as a poet. "No, we don�t want that." I�ve got some licks, I�ve got some skills with my fingers on the guitar. "No, we don�t want that either." Well, I�ve got a broken heart. "No, we don�t want that." I�ve got a pretty girlfriend. "No, we don�t want that." I�ve got sexual desire. "No, we don�t want that. I�ve got a whole lot of things and the tollgate keeper says, "That�s not going to get it. We want you in a condition that you are not accustomed to. And that you yourself cannot name. We want you in a condition of receptivity that you cannot produce by yourself." How are you going to come up with that? [Laughs] I don�t know. But, you know, I�ve been lucky over the years. I�ve been willing to pay the price. [Pause] It�s hard to name. It�s hard to name because it keeps changing. Is it a sense that you are reaching outside of yourself to write these songs? If I knew where the good songs came from, I�d go there more often. It�s a mysterious condition. It�s much like the life of a Catholic nun. You�re married to a mystery. Do you consider the tower of song to be a place of exile or of retreat? I think you can use it as a retreat but it doesn�t work. It�s best thought of as a factory. It�s some combination between a factory and a bordello. But it�s just the tower of song. You�ve spoken about the hard labor that goes into your songs, and part of that must be due to the fact that your verses are so rich, and that you write long songs with many verses. I think other songwriters might have come up with two of the verses in "Democracy" and stopped. I�ve got about sixty. There are about three or four parallel songs in the material that I�ve got. I saw that the song could develop in about three or four different ways and there actually exist about three or four versions of "Democracy." The one I chose seemed to be the one that I could sing at that moment. I addressed almost everything that was going on in America. Concentration camp behind a smile. So while everyone was rejoicing, I thought it wasn�t going to be like that, euphoric, the honeymoon. So it was these world events that occasioned the song. And also the love of America. Because I think the irony of American is transcendent in the song. First we killed the Lord and then we stole the blues. Who really gets to profit and who really gets to pay? Who really rides the slavery ship right into Charleston Bay? Democracy is coming to the U.S. A. Why did you take that out? I didn�t want to compromise the anthemic, hymn-like quality. I didn�t want it to get too punchy. I didn't want to start a fight in the song. I wanted a revelation in the heart rather than a confrontation or a call-to-arms or a defense. There were a lot of verses like that. Good ones. It�s hard to believe you�d write a verse like that and discard it. The thing is that before I can discard the verse, I have to write it. Even if it�s bad -- those two happen to be good, I�m presenting the best of my discarded work -- but even the bad ones took as long to write as the good ones. As someone once observed, it�s just as hard to write a bad novel as a good novel. It�s just as hard to write a bad verse as a good verse. I can�t discard a verse before it is written because it is the writing of the verse that produces whatever delights or interests or facets that are going to catch the light. The cutting of the gem has to be finished before you can see whether it shines. You can�t discover that in the raw. I love the verse that has "I�m stubborn as the garbage bags that refuse to decay / I�m junk but I�m still holding up this little wild bouquet." Most of us from the middle-class, we have a kind of old, 19th century idea of what democracy is, which is, more or less, to over-simplify it, that the masses are going to love Shakespeare and Beethoven. That�s more or less our idea of what democracy is. But that ain�t it. It�s going to come up in unexpected ways from the stuff that we think are junk: the people we think are junk, the ideas we think are junk, the television we think is junk. You also have the line "The maestro says it�s Mozart, but it sounds like bubble-gum." That junk is sometimes promoted as great art. Some stuff is being promoted as junk and it is great art. Remember the way that a lot of rock and roll was greeted by the authorities and the musicologists and even the hip people. And when people were putting me down as being one thing or another, it wasn�t the guy in the subway. He didn�t know about me. It was the hip people, writing the columns in the hip newspapers, college papers, music papers. So it�s very difficult to see what the verdict is going to be about a piece of work. And the thing that makes it an interesting game is that each generation revises the game, and decides on what is poetry and song for itself. Often rejecting the very carefully considered verdicts of the previous generations. I mean, did the hippies ever think that they would be the objects of ridicule by a generation? Self-righteous and prideful for the really bold and courageous steps they had taken to find themselves imbued in the face of an unmovable society; the risks, the chances, the dope they smoked, the acid they dropped? Did they ever think they would be held up as figures of derision, like cartoon characters? No. And so it is, with every generation. There�s that remark: "He who marries the spirit of his own generation is a widower in the next." You�ve written novels and books of poetry. And you once made a comment about having a calm, domestic life as a novelist before becoming a songwriter. Is the life of a songwriter entirely different than that of the poet or novelist? It used to be. Because I used to be able to write songs on the run. I used to work hard but I didn�t really begin slaving over them till 1983. I always used to work hard. But I had no idea what hard work was until something changed in my mind. I don�t really know what it was. Maybe some sense that this whole enterprise is limited, that there was an end in sight. An end to your songwriting? It wasn�t that way for you prior to that time? It was, but I�m speaking of degree. I always thought that I sweated over the stuff. But I had no idea what sweating over the stuff meant until I found myself in my underwear crawling along the carpet in a shabby room at the Royalton Hotel unable to nail a verse. And knowing that I had a recording session and knowing that I could get by with what I had but that I�m not going to be able to do it. That kind of change I knew gradually was there and I knew that I had to work in a certain way that was nothing I had ever known anything about. In the early days, did a song such as "Suzanne" come easy to you? No, no, I worked months and months on "Suzanne." It�s just a matter of intensity. I was still able to juggle stuff: a life, a woman, a dream, other ambitions, other tangents. At a certain point I realized I only had one ball in my hand, and that was The Song. Everything else had been wrecked or compromised and I couldn�t go back, and I was a one-ball juggler. I�d do incredible things with that ball to justify the absurdity of the presentation. Because what are you going to do with that ball? You don�t have three anymore. You�ve just got one. And maybe only one arm. What are you going to do? You can flip it off your wrist, or bounce it off your head. You have to come up with some pretty good moves. You have to learn them from scratch. And that�s what I learned, that you have to learn them from scratch. There is some continuity between "Suzanne" and "Waiting for A Miracle" [sic]. Of course there is; it�s the same guy. Maybe it�s like you lose your arm, you�re a shoemaker. You�re a pretty good shoemaker, maybe not the best but one of the top ten. You lose your arm and nobody knows. All they know is that your shoes keep on being pretty good. But in your workshop, you�re holding onto the edge of the shoe with your teeth, you�re holding it down and hammering with your other hand. It�s quite an acrobatic presentation to get that shoe together. It may be the same shoe, it�s just a lot harder to come by and you don�t want to complain about it. So maybe that�s all that happened, is that I got wiped out in some kind of way and that just meant that I had to work harder to get the same results. I don�t have any estimation or evaluation. I just know that the work got really hard. Why did you move from writing novels and poems to songwriting? I never saw the difference. There was a certain point that I saw that I couldn�t make a living (as a poet or novelist). But to become a songwriter or a singer, to address an economic problem, is the height of folly, especially in your early thirties. So I don�t know why I did it or why I do anything. I never had a strategy. I just play it by ear. I just know that I had written what I thought was a pretty good novel, Beautiful Losers. It had been hailed by all the authorities as being a work of significance. Whether it is or not, who knows. But I had the credentials. But I couldn�t pay my bills. It had only sold a couple thousand copies. So it was folly to begin another novel. I didn�t want to teach, it just wasn�t my cup of tea. I didn�t have the personal style for that. I was too dissolute. I had to stay up too late, I had to move too fast, it wasn�t a good place for me. Have you ever had the desire to write another novel? You toy with it but it�s the regime that I like very much, writing a novel. I like that you really can�t do anything else. You�ve got to be in one place. That�s the way it is now with songwriting. I�ve got to have my synthesizer and my Mac. I can�t really entertain a lot of distractions. [Otherwise] you forget what it�s about very easily. Is it more satisfying for you to write a song, something that you can enter again after writing and perform? The performance of songs is a wonderful opportunity. It is a great privilege. It is a great way to test your courage. And to test the song. And even to test the audience. I�m not trying to suggest that this has any dimension or hierarchy of better, worse. It�s just a shape that it�s got to have, otherwise I can�t wrap my voice around it. There are songs like "Dress Rehearsal Rag" that I recorded once and I will never sing. Judy Collins did a very beautiful version of it, better than mine. I would never do that song in concert; I can�t get behind it. But it�s not a matter of excellence or anything but just the appropriate shape of my voice and psyche. Earlier you said that you couldn�t sing an early version of "Anthem" because it had a lie in it. Does this mean that the songs have to resonate in truth for you to be able to sing them? They have to resonate with the kind of truth that I can recognize. They have to have the kind of balance of truth and lies, light and dark. Jennifer Warnes said that you once told her that the most particular answer is the most universal one. I think so. I think that�s advice that a lot of good writers have given me and the world. You don�t really want to say "the tree," you want to say "the sycamore." I don�t know. And it�s not even true. But there is a certain truth to it. We seem to be able to relate to detail. We seem to have an appetite for it. It seems that your days are made of details, and if you can�t get the sense of another person�s day of details, your own day of details is summoned in your mind in some way rather than just a general line like "the days went by." It�s better to say "watching Captain Kangaroo." Not "watching TV." Sitting in my room "with that hopeless little screen." Not just TV, but the hopeless, little screen. I think those are the details that delight us. They delight us because we can share a life then. It�s our sense of insignificance and isolation that produces a great deal of suffering. It�s one of the great things about your work, your rich use of details. So many songs we hear are empty, and have no details at all. I love to hear the details. I was just working on a line this morning for a song called "I Was Never Any Good at Loving You." And the line was -- I don�t think I�ve nailed it yet -- "I was running from the law, I thought you knew, forgiveness was the way it felt with you" or "forgiven was the way I felt with you." Then I got a metaphysical line, about the old law and the new law, the Old Testament and the New Testament: "I was running from the law, the old and the new, forgiven was the way I felt with you." No, I thought, it�s too intellectual. Then I thought I got it: "I was running from the cops and the robbers too, forgiven was the way I felt with you." You got cops and robbers, it dignifies the line by making it available, making it commonplace. Each of those three versions work well. And so many of your lines, though I understand how hard you work on them and revise them, have the feeling of being inevitable. They don�t feel forced; they just feel like the perfect line. I appreciate that. Somebody said that art is the concealment of art. Unless you want to present the piece with the axe-marks on it, which is legitimate, [to show] where the construction or the carving is. I like the polished stuff too. At a certain point, when the Jews were first commanded to raise an altar, the commandment was on unhewn stone. Apparently the god that wanted that particular altar didn�t want slick, didn't want smooth. He wanted an unhewn stone placed on another unhewn stone. Maybe then you go looking for stones that fit. Maybe that was the process that God wanted the makers of this altar to undergo. Now I think Dylan has lines, hundreds of great lines that have the feel of unhewn stone. But they really fit in there. But they�re not smoothed out. It�s inspired but not polished. That is not to say that he doesn�t have lyrics of great polish. That kind of genius can manifest all the forms and all the styles. When you�re working on lines such as those that you mentioned, is that a process of working just with words, separate from music? No. I don�t remember the chicken or the egg, I know the song began. But I keep moving them back and forth between the notebook and the keyboard. Trying to find where the song is. I had it as a shuffle. I had it as a kind of 6/8 song like "Blueberry Hill." So when working on a lyric, there�s always a melody in your mind that accompanies the lyric? Usually, yes, the line will have a kind of rhythm that will indicate, at the very least, where the voice will go up and where the voice will go down. I guess that�s the rudimentary beginnings of what they call melody. I asked that because your songs, unlike most, are always in perfect meter and perfect rhyme schemes. It seems it would be possible to work on them just as lyrics, without music. It doesn�t seem to work that way. Because the line of music is very influential in determining the length of a line or the density, the syllabic density. You mentioned working on a Mac. Is that musical work as well as lyrical work? I like to set them up. They usually go from the napkin to the notebook to the Mac. And back and forth. And there�s a certain moment when there�s enough. I like to see it. They say that the Torah was written with black fire on white fire. So I get that feeling from the computer, the bright black against the bright background. It gives it a certain theatrical dignity to see it on the screen. And also work processing enables you to cut and paste. But I generally have to go back to the napkin and the notebook. But at certain periods during the making of the song, I�ll mock it up as a song just to be able to study it in a certain way. [Laughs] I smiled to myself when that line came. A friend of mine said, "I dare you to leave that line in." You were tempted to remove it? I�m tempted to remove everything. At any time. I guess I�ve got a kind of alcoholic courage. Most people are reluctant to remove things. My sin is on the other side. I�m ready to discard the whole song at any time and start over. And I think it�s just as grave a defect because probably, at some point down the line, I�ve thrown away some songs that were pretty good. And they�re buried out there somewhere. Do you ever construct songs from things you�ve discarded? Do you think being Jewish affects your writing? I have no idea. I�ve never been anything else. So I don�t know what it would be like not to have this reference. This reference that you can reject or embrace. You can have a million attitudes to this reference but you can�t change the reference. You�ve studied the Torah and the Talmud? Yeah, yeah, in a modest way. When you�re writing a song like "The Future," for example, which is in A minor, do you choose a key that will match the tone of the song? Yeah. I choose a key not so much as Garth Hudson [of the Band] would, who has a whole philosophy of music based on keys and colors and what moods different keys produce. I think that�s quite valuable, I just don�t have the chops to be able to do that because I can�t play in all the keys. So I can�t really examine the effects of all the keys. With the synthesizer I could play in all of them but I don�t try that. Do you think that there are colors that coincide with each key? I think there are but mostly for me it�s range. Some keys will place the voice a little deeper than others. My voice has gotten very very deep over the years and seems even to be deepening. I thought it was because of 50,000 cigarettes and several swimming pools of whiskey that my voice has gotten low. But I gave up smoking a couple of years ago and it�s still getting deeper. You actually do sound like a different person on the earlier records. Sounds like a different person. Something happened to me too. I know what it was. My voice really started to change around �82. It started to deepen and I started to cop to the fact that it was deepening. That very low voice is such a resonant sound. Are you happy with how it has evolved? I�m surprised that I can even, with fear and trembling, describe myself to myself as a singer. I�m beginning to be able to do that. I never thought I would but there is something in the voice that is quite acceptable. I never thought I would be able to develop a voice that had any kind of character. In terms of keys again, do you ever change keys while writing? Oh, yeah. It�s funny, today I was thinking about modulating in a tune which I have never done. I�ve never modulated a song in midstream. Key changes can be quite corny. I can�t think of a song of yours where you would want one. No, I don�t know. I think it could be nice. I�ve never tried it. I might find a way to do it -- maybe in the middle of a line except in the beginning of a verse. There might be some sneaky ways to do it. I did it in a certain kind of way in "Anthem." When I went up to the B-flat from the F. It threw it into another key. So in a sense, that chorus is in another key and then it comes back through suspended chords and into the original key. So I have looked into them. Do you feel that minor keys are more expressive than major keys? I think the juxtaposition of a major chord with no seventh going into a minor chord is a nice feel. I like that feel. In "Famous Blue Raincoat" which is A minor, the chorus shifts into C major which is very beautiful. Yeah. That�s nice. I guess I got that from Spanish music, which has that. You mentioned how much you discard of what you write. Is your critical voice at play while writing, or do you try to write something first and then bring in the critic? I bring all the people in to the team, the work force, the legion. There�s a lot of voices that these things run through. Do they ever get in the way? Get in the way hardly begins to describe it. [Laughter] It�s mayhem. It�s mayhem and people are walking over each other�s hands. It�s panic. It�s fire in the theater. People are being trampled and they�re bullies and cowards. All the versions of yourself that you can summon are there. And some you didn�t even know were around. When you finally finish a song, is there a sense of triumph? Oh, yes. There�s a wonderful sense of done-ness. That�s the thing I like best. That sense of finish-ness. A long time. It lasts a long time. I�m still invigorated by having finished this last record and I finished it six months ago and I still feel, "God, I finished this record. Isn�t it great?" You have to keep it to yourself after a while. Your friends are ready to rejoice with you for a day or a week. But they�re not ready to rejoice after six months of "Hey, let�s go get a drink, I finished my record six months ago!" It�s an invitation people find easy to resist. Does drinking ever help you write? No. Nothing helps. But drinking helps performing. Sometimes. Of course you�ve got to be judicious. Would it be okay with you if I named some of your songs to see what response you have to them? That�s the only song I wrote in one sitting. The melody I had worked on for some time. I didn�t really know what the song was. I remember that my mother had liked it. Then I was in Edmonton, which is one of our largest northern cities, and there was a snowstorm and I found myself in a vestibule with two young hitchhiking women who didn�t have a place to stay. I invited them back to my little hotel room and there was a big double bed and they went to sleep in it immediately. They were exhausted by the storm and the cold. And I sat in this stuffed chair inside the window beside the Saskatchewan River. And while they were sleeping I wrote the lyrics. And that never happened to me before. And I think it must be wonderful to be that kind of writer. It must be wonderful. Because I just wrote the lines with a few revisions and when they awakened I sang it to them. And it has never happened to me like that before. Or since. "Hey, That�s No Way to Say Goodbye." The first band I sang that for was a group called the Stormy Clovers, a Canadian group out of Toronto. I wrote it in two hotels. One was the Chelsea and the other was the Penn Terminal Hotel. I remember Marianne looking at my notebook, seeing this song and asking, "Who�d you write this for?" [Pause] I came to New York and I was living at other hotels and I had heard about the Chelsea Hotel as being a place where I might meet people of my own kind. And I did. [Laughs] It was a grand, mad place. Much has been written about it. That song was written for Janis Joplin? It was very indiscreet of me to let that news out. I don�t know when I did. Looking back I�m sorry I did because there are some lines in it that are extremely intimate. And since I let the cat out of the bag, yes, it was written for her. That was a song that took me a long time to write. Dylan and I were having coffee the day after his concert in Paris a few years ago and he was doing that song in concert. And he asked me how long it took to write it. And I told him a couple of years. I lied actually. It was more than a couple of years. Dylan said, around the time that "Hallelujah" came out, that your songs were almost like prayers. I didn�t hear that but I know he does take some interest in my songs. We have a mutual interest. Everybody�s interested in Dylan but it�s pleasant to have Dylan interested in me. It seems that his comment is true. Songs like "Hallelujah" or "If It Be Your Will" have a sanctity to them. "If It Be Your Will" really is a prayer. And "Hallelujah" has that feeling. A lot of them do. "Dance Me to the End of Love." "Suzanne." I love church music and synagogue music. Mosque music. It�s especially resonant in this time because so few songs that we hear have any sense of holiness. Well, there�s a line in "The Future": "When they said repent, I wonder what they meant." I understand that they forgot how to build the arch for several hundred years. Masons forgot how to do certain kinds of arches, it was lost. So it is in our time that certain spiritual mechanisms that were very useful have been abandoned and forgot. Redemption, repentance, resurrection. All those ideas are thrown out with the bathwater. People became suspicious of religion plus all these redemptive mechanisms that are very useful. That was one I thought was never finished. And I thought that Jennifer Warnes� version in a sense was better because I worked on a different version for her, and I thought it was somewhat more coherent. But I always thought that that was a song you could see the carpentry in a bit. Although there are some images in it that I am very pleased with. And the tune is real good. But I�m willing to defend it, saying it was impressionistic. It�s stylistically coherent. Well, I�m glad to hear it. Please disagree with any of this. I think the greatness of that song lies in the fact that you�re alluding to a story without coming out and giving all the facts, yet the story is more powerful because of what you don�t say, or can�t say. Yes. It may be. When I was at school there was a book that was very popular called Seven Types of Ambiguity. One of the things it criticized was something called "The Author�s Intention." You�ve got to discard the author�s intention. It doesn�t matter what the author�s intention in the piece is, or what his interpretation of the piece is, or what his evaluation or estimation of the piece is. It exists independently of his opinions about it. So maybe it is a good song, after all. I�m ready to buy your version. This is all part of this make-believe mind that one has to present socially and professionally if you care about these matters. It�s like asking somebody in a burning building if they care about architecture. [Laughs] Where�s the fire-escape? That�s all I care about in terms of architecture. Can I open the window? I felt for sometime that the motivating energy, or the captivating energy, or the engrossing energy available to us today is the energy coming from the extremes. That�s why we have Malcolm X. And somehow it�s only these extremist positions that can compel our attention. And I find in my own mind that I have to resist these extremist positions when I find myself drifting into a mystical fascism in regards to myself. [Laughs] So this song, "First We Take Manhattan," what is it? Is he serious? And who is we? And what is this constituency that he�s addressing? Well, it�s that constituency that shares this sense of titillation with extremist positions. I�d rather do that with an appetite for extremism than blow up a bus full of schoolchildren. When I first started playing guitar and writing songs, one of the first songs I ever learned was "Suzanne." And I remember thinking, "How does anyone write a song this beautiful?" And to this day, it�s a miracle. It is a miracle. I don�t know where the good songs come from or else I�d go there more often. I knew that I was on top of something. I developed the picking pattern first. I was spending a lot of time on the waterfront and the harbor area of Montreal. It hadn�t been reconstructed yet. It�s now called Old Montreal and a lot of the buildings have been restored. It wasn�t at that time. And there was that sailor�s church that has the statue of the Virgin. Gilded so that the sun comes down on her. And I knew there was a song there. Then I met Suzanne, who was the wife of Armand Villancour, a friend of mine. She was a dancer and she took me down to a place near the river. She was one of the first people to have a loft on the St. Lawrence. I knew that it was about that church and I knew that it was about the river. I didn't know I had anything to crystallize the song. And then her name entered into the song and then it was a matter of reportage, of really just being as accurate as I could about what she did. It took you a long time to finish? Yes, I had many work sheets. Nothing compared to the work sheets I have now. But it took me several months. Did she feed you tea and oranges, as in the song? She fed me a tea called Constant Comment, which has small pieces of orange rind in it, which gave birth to the image. I always loved the line, "And she shows you where to look among the garbage and the flowers, there are heroes in the seaweed." They�re hopeful lines. Yes. It is hopeful. I�m very grateful for those lines and for that song. It was begun in Greece because there were no wires on the island where I was living to a certain moment. There were no telephone wires. There were no telephones. There was no electricity. So at a certain point they put in these telephone poles, and you wouldn�t notice them now, but when they first went up, it was about all I did -- stare out the window at these telephone wires and think how civilization had caught up with me and I wasn�t going to be able to escape after all. I wasn�t going to be able to live this 11th-century life that I thought I had found for myself. So that was the beginning. Then, of course, I noticed that birds came to the wires and that was how that song began. "Like a drunk in a midnight choir," that�s also set on the island. Where drinkers, me included, would come up the stairs. There was great tolerance among the people for that because it could be in the middle of the night. You�d see three guys with their arms around each other, stumbling up the stairs and singing these impeccable thirds. So that image came from the island: "Like a drunk in a midnight choir." You wrote that you "finished it in Hollywood in a motel in 1969 along with everything else." What did you mean? Everything was being finished. The sixties were being finished. Maybe that�s what I meant. But I felt the sixties were finished a long time before that. I don�t think the sixties ever began. I thin the whole sixties lasted maybe fifteen or twenty minutes in somebody�s mind. I saw it move very, very quickly into the marketplace. I don�t think there were any sixties. I sweated over that one. I really sweated over it. I can show you the notebook for that. It started off as a song called "I Cried Enough for You." It was related to a version of "Waiting for a Miracle" [sic] that I recorded. The rhyme scheme was developed by toeing the line with that musical version that I put down. But it didn�t work. You quoted Dylan once when you said, "I know my song well before I start singing." Do you always have the song completely finished before you begin recording? Yeah. Sometimes there�s a rude awakening. As there have been several times in the past. As with "Anthem." Several times I thought I had sung that song well and then when I heard it I realized I hadn�t. What do you think of songwriters who write in the studio? I think they�re amazing. I have tremendous admiration for that kind of courage and that kind of belief in one�s own inspiration. That the gods are going to be favorable to you. That you�re going to go in there with nothing but the will and the skill, and the thing is going to emerge. And great stuff has been done that way. It�s not like this never works. There are masters of that style. Dylan is one of them. I think he�s gone in with nothing and come up with great things. That is to say that my impression about Dylan is that he�s used all the approaches: the spontaneous, the polished, the unhewn, the deliberate. He masters all those forms. There aren�t many songwriters of your generation who have been able to maintain the quality of their past work the way you have been able to. First of all, you get tired. There aren�t that many bullfighters in their forties. You do your great work as a bullfighter in your twenties and your thirties. There is a certain age that is appropriate to this tremendous expenditure of energy and the tremendous bravery and courage that you need to go into the fray. It often is a young man�s game, or as Browning said, "The first fine careless frenzy." That is what the lyric poem is based on, the song is based on. But there are some old guys who hang in there and come up with some very interesting work. In your work you�ve shown that a songwriter can go beyond that early frenzy and come to a new place and do new things that haven�t been done. I certainly felt the need to find that place. I always thought I was in it for the long haul, touch wood. Does it have to do with interest, that you�re still interested with the process? It was to do with two things. One is economic urgency. I just never made enough money to say, "Oh, man, I think I�m gonna get a yacht now and scuba-dive." I never had those kinds of funds available to me to make radical decisions about what I might do in life. Besides that, I was trained in what later became known as the Montreal School of Poetry. Before there were prizes, before there were grants, before there were even girls who cared about what I did. We would meet, a loosely defined group of people. There were no prizes, as I said, no rewards other than the work itself. We would read each other poems. We were passionately involved with poems and our lives were involved with this occupation. And we�d have to defend every line. We�d read poems to each other and you were attacked! With a kind of savagery that defangs rock criticism completely. There ain�t anybody that I�ve ever read who can come up with anything like the savagery, and I might say the accuracy that we laid on each other. We had in our minds the examples of poets who continued to work their whole lives. There was never any sense of a raid on the marketplace, that you should come up with a hit and get out. That kind of sensibility simply did not take root in my mind until very recently. [Laughs] I think maybe it�s a nice idea but it�s not going to happen when you write seven minute songs. So I always had the sense of being in this for keeps, if your health lasts you. And you�re fortunate enough to have the days at your disposal so you can keep on doing this. I never had the sense that there was an end. That there was a retirement or that there was a jackpot. You mentioned the early frenzy of youth. Do you find you need frenzy or conflict in your life to write great songs or can you create from a place of calm? I certainly think so and I�m looking forward to achieving that interior condition so that I can write from it. But I haven�t yet. I�ve come a long way compared to the kind of trouble I was in when I was younger. Compared to that kind of trouble, this kind of trouble sounds like peace to me. But of course one is still involved in this struggle and while you�re involved in this struggle you know peace is just a momentary thing, but you can�t claim it. I�m a lot more comfortable with myself than I was a while ago. I�m still writing out of the conflicts and I don�t know if they�ll ever resolve. Do you find the song to be a more powerful artform than others? I love it. As a mode of employment. I don�t even think about artforms. I�m very grateful to have stumbled into this line of work. It�s tough but I like it. Do you have the sense that some of your songs are lasting and timeless? Sometimes I have a feeling that, as I�m fond of saying, a lot of my songs have lasted as long as the Volvo. They seem to be sturdy. This last album [The Future] I think is very very sturdy. If it has any faults it�s that it�s a little too well armored. It seems to have a kind of resilience like a little Sherman Tank, that it can go over any landscape. I don�t know whether that�s something you want parking in our garage, but it seems to have a kind of armored energy. I�ve tried to make the songs sturdy over the years. Is it your feeling that songs will continue to evolve, that there are new places to go with them? experimentally. Because I think that songs primarily are for courting, for finding your mate. For deep things. For summoning love, for healing broken nights, and for the central accompaniment to life�s tasks. Which is no mean or small thing. I think it�s important that they address those needs rather than they look into themselves in terms of experimenting with form or with matter. But I think that they will, of course, change. I think that, although there�s got to be songs about making love and losing and finding love, the fact that you�re on the edge of a burning city, this definitely is going to affect the thing. But it affects it in surprising ways that you don�t have to worry about. Like "Lili Marlene" came out of the war. It�s a very conventional song. A very beautiful song. It touched the troops on both sides. People who had undergone the baptism of fire sang "Lili Marlene" though they thought it was the corniest song in the world. So I don�t think it�s necessary to tinker with the form. It�s just necessary to let the world speak to you. Do you have a discipline for writing? Do you write at the same time every day? I get up very early. I like to fill those early hours with that effort. Most of your writing is done in the morning? Yes. I find it clearer. The mind is very clear in those early hours. Is that a daily thing? Usually. I blow it and fall into disillusion and disrepair. Where the mind and the body and the writing and the relationships and everything else goes to hell. I start drinking too much or eating too much or talking too much or vacationing too much. And then I start recovering the boundaries and putting back the fences and trimming the hedges. But when the thing is working, I find early in the morning best. I get up at 4:30. My alarm is set for 4:30. Sometimes I sleep through it. But when I�m being good to myself, I get up at 4:30, get dressed, go down to a zendo not far from here. And while the others, I suppose, are moving towards enlightenment, I�m working on a song while I�m sitting there. At a certain moment I can bring what I�ve learned at the zendo, the capacity to concentrate, I can bring it to bear on the lines that are eluding me. Then I come back to the house after two hours, it�s about 6:30 now, quarter to seven. I brew an enormous pot of coffee and sit down in a very deliberate way, at the kitchen table or at the computer, and begin, first of all, to put down the lines that have come to me so that I don�t forget them. And then play the song over and over again, try to find some form. Those are wonderful hours. Before the phone starts ringing, before your civilian life returns to you with all its bewildering complexities. It�s a simple time in the morning. A wonderful, invigorating time. Do you find that your mind is always working on songs, even when you�re not actively working? Yes. But I�m actively working on songs most of the time. Which is why my personal life has collapsed. Mostly I�m working on songs. SONGWRITERS ON SONGWRITING by Paul Zollo, Expanded Edition, Da Capo Press 1997; 656 pages, 18.95 USD. A wonderfully illuminating and inspiring book that features 52 interviews with the following great songwriters: Mose Allison, Joan Baez, Burt Bacharach & Hal David, Walter Becker, Jackson Browne, Dave Brubeck, Lindsey Buckingham, David Byrne, Sammy Cahn, Felix Cavaliere, Bruce Cockburn, Leonard Cohen, David Crosby, Willie Dixon, Donovan, Lamont Dozier, Bob Dylan, Dan Fogelberg, Gerry Goffin, Bruce Hornsby, Janis Ian, Rickie Lee Jones, Carole King, k.d. lang, Tom Lehrer, Jay Livingston & Ray Evans, Los Lobos, Madonna, Graham Nash, Randy Newman, Harry Nilsson, Laura Nyro, Yoko Ono, Van Dyke Parks, Tom Petty, R.E. 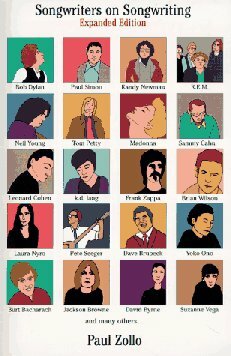 M., Stan Ridgway, Robbie Robertson, Todd Rundgren, Carlos Santana, Pete Seeger, Jules Shear, Paul Simon, P.F. Sloan, Richard Thompson, Townes Van Zandt, Suzanne Vega, Loudon Wainright III, Jimmy Webb, Brian Wilson, Neil Young, Frank Zappa.